The Toad gift set is perfect for those of us who live to entertain. Oysters are always better shared! Make it easy for your guests to effortlessly open steamed or raw oysters and have a beautiful way to display them on your setting. GREAT CAUSE & ECO-FRIENDLY- A portion of the proceeds from the sale of all Toadfish products goes directly to oyster habitat restoration projects. Handle made from post consumer recycled plastic. Wooden box made from sustainably sourced wood. For every oyster knife sold, we will plant 10 sq. feet of new oyster habitat. Our oyster knife is also made from post consumer recycled plastic! ERGONOMIC DESIGN-Japanese stainless steel, stain-free, rust-resistant blade that is bent on the tip section allowing raw oysters to 'pop' open from the hinge. Ergonomic thumb print handle design eliminates hand slippage making shucking safer. Blade through design creating one of the most durable oyster shuckers on the market. 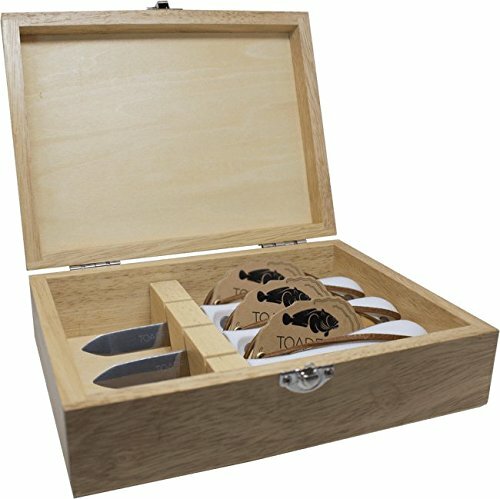 PERFECT GIFT SET - Includes 3 oyster knives and a wooden display box. For the oyster lover in your life. High quality oyster knives used by professional kitchens around the country. Featured in Food & Wine and Garden & Gun magazine. 100% CUSTOMER SATISFACTION GUARANTEE- We know that an oyster knife is a specialized tool, so we want to make sure you are 100% satisfied. If you don't absolutely love your new oyster shucker, we will take it back and offer a replacement or refund. If you have any questions about this product by Toadfish, contact us by completing and submitting the form below. If you are looking for a specif part number, please include it with your message.